PMC IB1S (10 inch drivers to 25Hz) large format mastering grade speakers (not near fields), 28 x 1.2Mx0.6M bass traps, Crane Song Solaris Quantum DAC (lowest ever published jitter spec), Manley Massive Passive, 500 WPC Hypex Class D amplification, Vari Mu, Sontec Analogue eq, Summit Audio Compressor, Mytek ADC, ear selected plug ins. When it comes to mastering psy trance and trance I know how this music is meant to sound on a huge crystal clear P.A. system. Using truly mastering grade room acoustics and speakers it is time to hear the difference I can make for your tracks when they hit the dance floor. * Knowing the high degree of technical knowledge that psy trance / trance producers have please see bottom of page for more details on acoustic treatment and the large format PMC IB1S (10 inch driver) speakers with 500watt per channel Hypex Class D amplification. Trance music has a rich history since the early-mid 1990’s an up tempo music form which is both unique and influential. Mastering trance music is best performed in an highly accurate and controlled monitoring environment. Large scale loudspeakers with defined and deep bass response in a well treated acoustic environment is ideal. A few foam or rockwool bass traps will not flatten the low end of a room, it is a fantasy that near fields and a couple of corner straddles is sufficient.At SafeandSound mastering there are no less than 28 x 1.2M x 0.6M bales of Rockwool/Earthwool (RW3/RW45 and 28kg m3 densities). I have some traps that are 2 Meters deep, that flattens the low end unlike almost useless foam) It is important to know your music will sound right at the festival, party or club, here there is accuracy to 30Hz. Mastering worthy reference speakers which can reproduce the full frequency range and highlight distortion and harshness early gives music the best chance of translating well to club systems/ out door P.A.s and all other environments. Small speakers will not cut it for mastering, check your engineer uses better equipment than you already own yourself ! Mastering trance/psy trance also requires a mastering engineer who is sympathetic to the genre of dance music as a whole and also understands that trance music is not “preset” music. I take the challenge of mastering trance and psy personally it’s a style I know and enjoy working with, knowing the harmonically rich mixes involved require special attention, along with the huge importance of your kick and bass. With variations on highly commercial sounds and underground styles mastering trance and its variants, be it commercial, vocal trance, euphoric, psy trance (Forest, Dark psy, Full On or Progressive, Hi Tec, Goa, Psy chill, Psy breaks, Psybient) requires someone who has an understanding of the goals of this music. Professionals mastering trance music (and mastering psy trance music) will utilize a combination of tools in order to get the last drop of quality out of the music. Typically high end analogue equalization to promote depth and space in a mix down, high end compression, the creme de la creme of digital tools and superb fidelity reproduction systems. Trance can get harsh if the upper mid range is not carefully examined and in balance with the rest of the spectrum, a good trance mastering engineer will perfect the right tonal balance. In addition, typically you want competitive volume, this can be discussed and the right choices made for your music so it is the perfect compromise between volume and fidelity. It is important when mastering for club based systems that the full audio range is heard down to the deepest lows. This is so any adjustments and corrections to the all important bass frequencies can be made. It is easy to miss common problems in the lower frequencies when attempting to self finalize music destined for club systems and radio transmission. Get it wrong and the results will be bad sounding club “play outs”, festivals, parties and broadcasts. Synthesizer heavy trance music requires a keen ear to master successfully. If you are considering mastering trance music, drop me a line or by all means call to discuss your project and requirements. Custom built T-Filter equalizer (Sontec inspired circuit), stereo ganged. The finest ear selected DSP (software) money can buy. DMG, Fabfilter, Nugen etc. 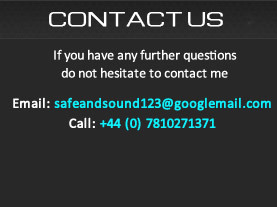 Barry Gardner has been operating SafeandSound mastering for 10 years without equipment being moved, housed in a very well treated room, for repeatable results. 28 huge henge style bass traps plus diffusors. Very serious bass trapping. 10 years working as head of engineering in UK production company before dedicating as a full time mastering engineer. Just send your track via www.wetransfer.com Standard pricing 1 Track £30.00, for full details on pricing please see “Pricing and payments” on the menu bar. * The mastering studio is treated with no less than 28 bales (1.2m x 0.6m) of Rockwool RW6/RW45, Knauf RS45 and Knauf 28kg/m3 fibre glass/mineral wool. Room is flat to 25Hz meaning I know precisely what is happening to the low end in this room using PMC IB1S. When your music hits a Funktion 1 system you want to know it is going to sound right. The acoustic treatment at SafeandSound is copious and serious. I understand the sheer quantity of treatment required to have a flat bass response in a room. There is significantly more treatment in room today than in the old site photos, you won’t find better results. Some traps are 2 meters deep ! I know the importance of hypnotic, punchy and powerful kick and bass (KbBB) – mid range clarity without harshness and a smooth top end for trance genres. Full range true mastering grade monitoring and room is critical.